New York photographer David Bergman has cornered the market capturing epic moments in world history with his Gigapan images. Bergman's 1,474 megapixel Gigapan of President Obama's inauguration has been viewed over 15 million times by people in 210 countries. His latest classics are being compiled at the 2012 London Olympic games showing the Opening Ceremonies and inside the Aquatics Center during competition. My first Gigapan from the 2012 London Olympics is now online. You’ll find it in three different places. It’s on the official NBC Olympics website, Sports Illustrated’s site, and it was even on the cover of Time.com earlier today. I made the Gigapan by shooting 425 images in a grid pattern (25 across by 17 down) with a Nikon D4 and 200-400 f/4 lens (zoomed to about 310mm) in a Gigapan Epic Pro. Each photo is 16 megapixels so, with a little bit of overlap on each one, the final high-resolution image is 81,992 X 37,520—more than three billion pixels. I’ve made a lot of Gigapans, but this was one of my toughest. I like to challenge myself - otherwise it would be boring - but I’ll admit that I was sweating this one out a bit. Since I shoot every frame manually, it can take 30-60 minutes to make one complete pass. I made one early in the ceremony when there was still some daylight and the crowd was nicely lit. But I really wanted to have the athletes (and the Queen!) in the photo. So when the athletes began marching into the stadium, I shot a complete pass for the sole purpose of getting the crowd. Those cool LED lights on the seats obscure some faces, but there was nothing I could do about that. As the infield filled up, I went back and began photographing the athletes. At the very end, when everyone was finally there, I had about 30 seconds to finish up before they killed all the lights and went on with the show. I just barely got enough frames to make it work. Overnight, I stitched together two complete Gigapans and then combined them so I had all the fans with the athletes on the field in the same photo. The image is far from perfect as you’ll find quite a few stitching errors. I fixed many of them but every time someone moves between frames, there’s potential for a cut off head or half a body. Sorry to anyone I sawed in half. 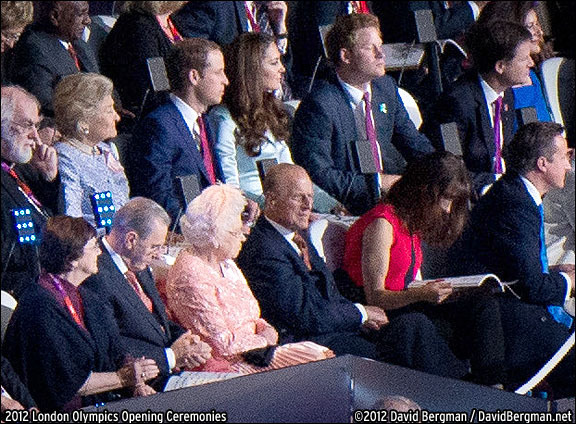 I did make sure the Queen, William, Kate, and Harry all look OK! Otherwise they may not have let me out of the country. In the end, I’m pretty happy with the result, considering that I stay up all night to get these massive Gigapans uploaded first thing in morning. All photographers are artists but there is a difference between photojournalism and fine-art photography. One serves up healthy portions of reality the other fantasy and whimsy. Back in the early 80’s when I was minoring in the visual arts program at the University of Florida I found myself failing art photography. My photos for class looked like they belonged in a daily newspaper. Influenced by the likes of photographer Michael O’Brien of the now defunct Miami News, the impressive news images in the Miami Herald, the incredible mentoring by staffers at the Associated Press, Phil Sandlin, Kathy Willens, Doug Jennings, Hal Moore, Mark Foley and so many other AP staffers, I built a photojournalism portfolio that launched my life-long career in an incredible news town. But in art photo, my grades did not reflect a bright future. So… I went the weird route; shot anything funky, abstract and bizarre. My grades shot up and my art photography professor, whose name escaped me three decades ago, smiled. Recently, the photographic portraits of US Olympic athletes, by Agence France-Presse photographer Joe Klamar, ignited a firestorm of vitriol on the Internet from fellow photographers and the general public. With my experience as a staff photographer for a major daily newspaper I don’t doubt Klamar when he says he was unprepared, totally unaware how his assignment was going to play out. Klamar says he thought he was going to shoot head shots at a press conference. Be honest, how often has that happened to you? It happens! Over the years there have been times my editors have sold me a bill of goods only to find the assignment is not quite what it has been presented to be. I believe Klamar. What we have here is a failure to communicate. Hey, we are in the communication business right? So what did Klamar do? His suite of images of the US Olympic athletes is funky, abstract and bizarre. They are so bad they are good. Brilliant really. There is no redundancy. His approach has a continuous theme while varying the poses for each subject. If you hang the photographic collection at any museum of modern art, my guess is it would get rave reviews. Put in the same situation, many of us would approach this assignment in a totally different manner. One that reflects a collective vision of the visual arts department at our daily newspaper or wire service. Respectful of our personal history while keeping in mind how the work will be presented in the mainstream media. If I know there is only a minute or so with each athlete, no set up time and no proper equipment I would streamline it all down and take a simple approach. Do more with less. I would recommend a classic journalistic style. Clean it up. That is what I would expect from any photojournalist, including from myself. No shuttlecocks on an athlete’s head, moose antlers, contorted bodies or creepy lighting. That’s not to say I would not reserve any of the above in my realm of creativity. No, these are all options. Why limit yourself? That said, the notion that Klamar took a nefarious approach in the way he photographed US Olympic athletes, as many suggest, can only be judged by those that know his true character. When I first saw Klamar’s images, mischief is the first thing that crossed my mind. A treacherous yet witty body of work reflecting US Olympians as incompetent. One person’s trash is another one's treasure. I do believe that Klamar failed to create images that serve the general public, newspapers and magazines but as fine-art the photographs may certainly have value, just not for me. See the good, the funky, the abstract and the bizarre, here. Here is an update on Joe Klamar, July 24th. 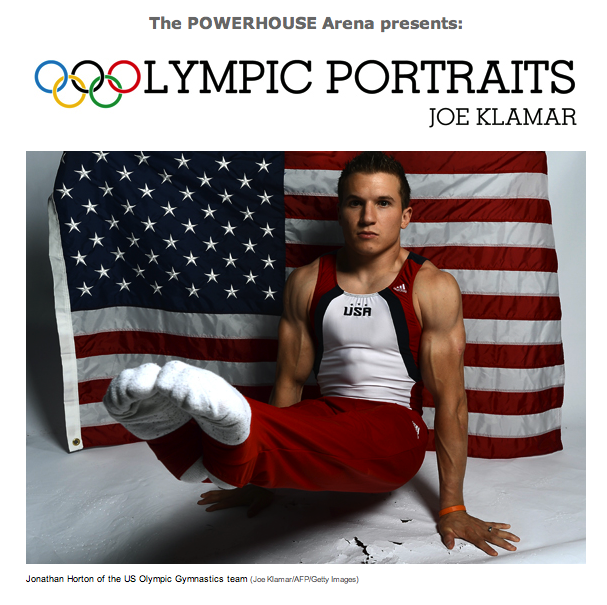 The POWERHOUSE Arena is proud to present Olympic Portraits by award-winning Agence France-Presse photographer, Joe Klamar. The exhibition consists of color portraits shot by Klamar at a Dallas, Texas hotel during the U.S. Olympic Committee's Media Summit this May. Many of the photographs were first met with harsh criticism from a bevy of news sites and photo blogs quick to highlight the images' alleged defects—citing the off-hand poses, the stressed lighting, the scarred backdrops—and labeled the work an affront to the elite status of the American Olympic athletic team. Such criticisms miss the work's powerful and nuanced compositions and display of personality. Here we see real individuals at the peak of their athletic career in ordinary and impromptu poses, sometimes playful, some quite intense, in an unplanned setting. You will not see world-class athletes like this anywhere.